Orvieto, an ancient city suspended halfway between heaven and earth, has long kept secret the labyrinth of caves and tunnels hidden in the silent darkness of the cliff. Those who lived on the top of this high plateau, dug this hidden labyrinth left unaltered over the past 2500 years; it is an invaluable reservoir of historical and archeological information which has only recently been the object of organic scientific studies. 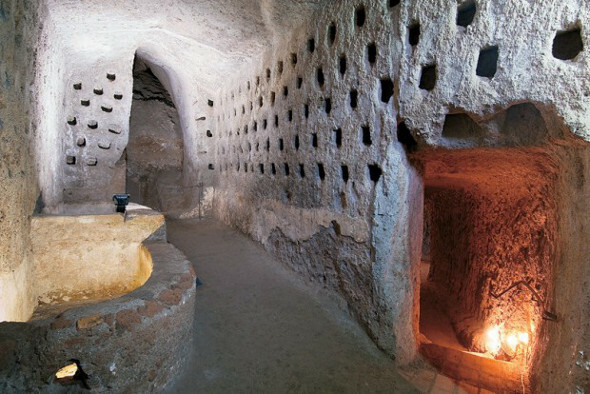 A guided tour of Orvieto Underground is therefore the best way to become acqainted with this new, unusual aspect of the culture of a city that abounds in history and outstanding art treasures. Mysterious fascinating echoes tell the tale of the Etruscan Velzna, while ghosts of medieval d renaissance Orvieto seem to lingerin the humid shadows. The endless succession of tunnels, stairs, unespected passageways, superimposed rooms bear witness to the creation over the centuries of this "city underground". There are offers for vacation rentals and hotels in the area of Orvieto! Click and Consult them immediately. It is an extraordinary journey in time, an exciting itinerary that takes you, with a minimum of effort, to the roots of the city and where the memories of its past are still "alive". - in February: only on Saturday and Sunday with the same timetable. - Closed on December 25th. In the above mentioned periods we take italian and english speaking tours. During the tourist seasons we have German speaking tours and we can also arrange tours in other languages (French, Spanish, Russian). Regarding private tours for groups, it is advisable to book in advance for any day of the year and at any hour of the day you need. 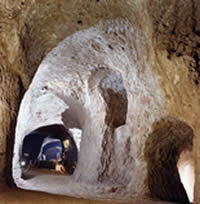 The guided tour takes place in Orvieto Underground, starting from Piazza Duomo 23 from 1st January to 31th December. Every day at 11:00 am, 12.15; 16.00, 17.15 (during periods of increased tourist numbers, every 15 minutes).